The Ontario government will hold a midnight sitting of the legislature early on Monday in an effort to expedite passage of a bill that will cut the size of Toronto's city council. Ontario legislators will meet for a rare midnight session early Monday morning. The Progressive Conservative government made the announcement following an also-unusual hour-long Saturday sitting in which they debated the controversial Bill 31, dubbed the Efficient Local Government Act. Premier Doug Ford's Tories have been trying to push through a bill that would cut the size of Toronto's city council from 47 to 25. "It's going to be lights on, cameras on, and everything is going to be out there in the open for people to see," said House Leader Todd Smith after being asked if the government was hurrying the legislation through under the cover of night. "We have a lot of great reasons as to why this bill should be passed as quickly as possible," he added. The bill re-introduces legislation that was struck down by an Ontario Superior Court judge, who said it violated the charter rights of candidates and voters in Toronto's upcoming election. The new legislation will invoke the notwithstanding clause to overrule the court decision. The government made the rare move because it finds itself crunched for time this week at the legislature. The International Plowing Match in Chatham-Kent, Ont., is set for Tuesday, and each year Queen's Park closes for a day so all politicians can attend. The midnight sitting will allow the Tory government to reach the needed 6.5 hours on this stage of debate to push the bill forward in the legislative process. "It's pretty clear the government is being very disrespectful about the legislature and what this house is all about," she said. "They're playing silly games at time when we have literally kids in our schools that can't drink the water because there's lead in it." "Our party, the PC caucus is here to work and get things done for the people of Ontario, so we're going to debate that bill from 12:01 a.m. until the early morning hours of Monday morning," he said. On Saturday, NDP House Leader Gilles Bisson asked House Speaker Ted Arnott to make a ruling on whether or not Bill 31 is too similar to the previous incarnation of the legislation, Bill 5. Bisson cited a standing order that forbids the re-introduction of identical motions or amendments that have already been decided on during the course of the same session. "The only difference is the notwithstanding clause," he said of the two bills. "We submit that they are the same bill, and the second bill is out of order." For his part, Arnott promised to review the matter and to "make my ruling and respond to the house in due course." 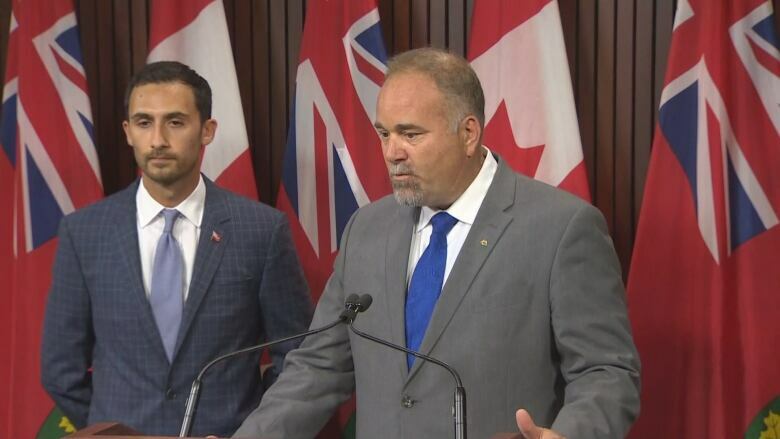 Smith, along with Deputy Government House Leader Stephen Lecce, also spoke to the media in the hour before Saturday's debate began, stating their intention to ask for unanimous consent from members to move the bill closer to becoming law. "We would hope that the opposition members don't delay this very important piece of legislation," said Smith. That motion was denied amid yells of "No" from various MPPs. "This premier said he was elected to save taxpayers money," he said. "He is wasting taxpayers' money with a frivolous political fight against the city of Toronto... How much money is this premier willing to waste for his own personal political agenda?" On Friday, three architects of that clause in the Charter of Rights and Freedoms condemned the Ontario government's use of the rare provision. Former prime minister Jean Chretien, former Saskatchewan premier Roy Romanow and former Ontario attorney general Roy McMurtry say the clause was meant to be used only in exceptional circumstances, and not as a means to circumvent proper processes.